On March 3rd, 2018 we had our 9th annual Boogie-Woogie/Blues Stomp at the Palladium Theatre here in St. Pete. The concert featured Matthew Ball (Detroit), Chase Garrett (St. Louis), Liz Pennock & Dr. Blues, and Wendy DeWitt with Kirk Harwood on drums (San Francisco) It was a blast! Another blast was playing at Ricky Nye’s 18th Blues & Boogie Piano Summit in Newport, Kentucky on Nov. 3 & 4, 2017. Other players included Ricky Nye & Bekah Williams (Cincy), Martjin Schok & Greta Holtrop (Netherlands), and Wendy DeWitt & Kirk Harwood (San Francisco). 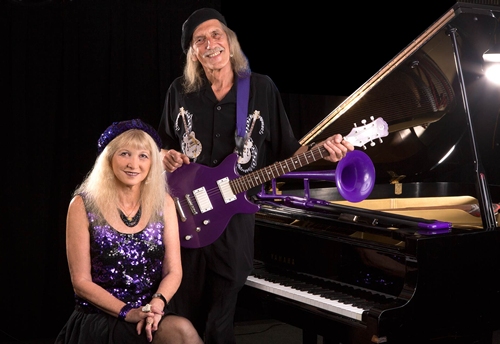 Although our song Quirky Boogie didn’t win “2017 Coolest Blues Song of the Year” (Big City Blues Magazine), it did make the finals & top third of 36 songs. Thanks again for all your votes! Congrats to all the Frequent Fan winners of 2017! #1: Wayne K.; #2: Linda M.; #3: Diann F.; #4: Midge P.; #5: Walt H.; #6 Teresa W.; #7: Priscilla H.; #8: Art O.; #9: Dan H.; #10: Harvey L.; #11: Sue L.
Besides our road tours, we’ve really enjoyed playing St. Pete venues including The Hangar, Pesky Pelican, & M-N-M BBQ. Thanks for being there and supporting us and these fine local venues! Please check our DATES page for our full schedule. RIP: Uncle Norman Clark, Shirley Seeley, Doug Naumann, Uncle Noah Garris, Jean Moore, cousin Mike Pennock, & Bob Pearson. 1988- 30 years ago- met & first played with Diamond Teeth Mary. 1993- 25 years ago- released Walking Mary’s Blues CD. 2003- 15 years ago- released Live from St. Pete CD. 2008- 10 years ago- released Boogie Woogie Staircase CD. 2008- Inducted into Boogie Woogie Piano Hall of Fame.